The Philadelphia Eagles’ trick play that left quarterback Nick Foles wide open for a touchdown reception was one of the most crucial plays of the Super Bowl. As it turns out, the decision to call the play actually came at the suggestion of Foles, as new mic’d up audio reveals. It was just one part of Nick Foles’ brilliant performance on Sunday that helped the Eagles earn their first Super Bowl in franchise history and got Foles named MVP. The Philadelphia Eagles won their first Super Bowl in franchise history on Sunday, defeating the New England Patriots, 41-33. It was thrilling game from start to finish, but one of the most captivating moments of the Big Game came in the waning seconds of the second quarter. Facing 4th-and-goal from the one-yard line, head coach Doug Pederson had a decision to make – kick the field goal and take the easy points, or risk going for it on fourth down and coming up empty-handed. We now know how the moment played out. The Eagles called a brilliant trick play that left quarterback Nick Foles wide open to catch a touchdown pass. Now, a new video reveals that it was Foles’ decision to call the gutsy play, a request that Pederson quickly agreed to. Once the decision was made, Foles called the play in the huddle, and executed to perfection. It was strikingly similar to a trick play the Patriots had run earlier in the game, but theirs had failed after Tom Brady missed a wide open catch. Foles was sure-handed, and scampered into the end zone for six. 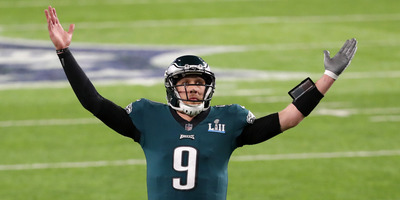 Fans would later learn that the play was actually straight out of Foles’ high school playbook, and the team had dubbed the trickery as “Philly Special” when they implemented it into the playbook before the Super Bowl. With an extended lead heading into halftime thanks to the touchdown, the Eagles were able to ride that momentum through the second half all the way to their first ever Super Bowl victory.